We have lived here for about 5 years and the heat has always behaved the wa y it should other then an occasional frozen pipe on the second floor and a broken circulator. The house has FHW by Oil, 3 zones: First Floor, Second Floor, Workshop. Fo r some reason we have had this odd thing going on for the past week. The s econd floor is constantly hot, like 73 degrees. The first floor is steady as it should at 68 degrees. This is with temps outside around 30-35. I ha ve the thermostats set up to turn the heat down to 58 at night and for all the time we have lived here the second floor would be hitting that by the m orning, just before it goes back up to 68. Now, I get up in the middle of the night and it is still in the 70's. I even turned it off at the thermos tat, the radiators are still hot. I took the thermostat controller right o ff the wall, no diff. The funny thing is if I check the zone control on th e boiler, the zone is not calling for heat, but the radiators are always ho t.
Sounds as if a valve for that zone is leaking through. I don't know much about hot water heat, but worked with lots of heating schemes in a factory. I am guessing that there is some kind of valve for each area of the house. If a radiator is hot without a call for heat, then I would assume a valve is open that is not suspose to. Check them to see if any power is getting to it when it is not suspose to. If no power and the outlet side of the valve is hot, then it is probably leaking. We have lived here for about 5 years and the heat has always behaved the way it should other then an occasional frozen pipe on the second floor and a broken circulator. The house has FHW by Oil, 3 zones: First Floor, Second Floor, Workshop. For some reason we have had this odd thing going on for the past week. The second floor is constantly hot, like 73 degrees. The first floor is steady as it should at 68 degrees. This is with temps outside around 30-35. I have the thermostats set up to turn the heat down to 58 at night and for all the time we have lived here the second floor would be hitting that by the morning, just before it goes back up to 68. Now, I get up in the middle of the night and it is still in the 70's. I even turned it off at the thermostat, the radiators are still hot. I took the thermostat controller right off the wall, no diff. The funny thing is if I check the zone control on the boiler, the zone is not calling for heat, but the radiators are always hot. Sounds more like a bad *oompa* valve. I see someone wants to get noticed. Liars really aren't my type, though. should other then an occasional frozen pipe on the second floor and a broken circulator. some reason we have had this odd thing going on for the past week. The second floor is constantly hot, like 73 degrees. The first floor is steady as it should at 68 degrees. This is with temps outside around 30-35. I have the thermostats set up to turn the heat down to 58 at night and for all the time we have lived here the second floor would be hitting that by the morning, just before it goes back up to 68. Now, I get up in the middle of the night and it is still in the 70's. I even turned it off at the thermostat, the radiators are still hot. I took the thermostat controller right off the wall, no diff. The funny thing is if I check the zone control on the boiler, the zone is not calling for heat, but the radiators are always hot. The zone control valve is stuck or the servo is burned out. I've replaced a few. And rebult a few - Not a lot of fun. jtpr;3026008 Wrote: > The funny thing is if I check the zone control on the boiler, the zone > is not calling for heat, but the radiators are always hot. I'd suspect the zone valve for the upstairs zone as well. I have 21 Honeywell V8043C zone valves in my building, so I'm intimately familiar with them. However, I do know that SOME older Erie zone valves will fail in the OPEN position. That is, if the valve stops working, it'll allow continuous flow of hot water into the radiators rather than stop the flow of water through the radiators. I can't remember all of the details now, but 10 to 15 years ago I remember one suite that had an old Erie zone valve got so hot that I was telling the tenants to open the windows to cool their apartment down until I could fix the problem. Anyhow, I do remember that the sector gear on the Erie zone valve in their apartment was stripped, and that when I replaced that gear, the zone valve worked properly again and the temperature in their suite went back to normal. In my experience, if a Honeywell V8043C zone valve sticks, it will stick in the closed position so the radiators will be cold. I can't recall every having to unstick a Honeywell that was stuck open. But, I've unstuck more Honeywell zone valves that were stuck in the closed postion than I care to remember. If it's a Honeywell zone valve manufactured after about 1980, then you can replace the "actuator" (also called the "head") on the zone valve without having to drain the heating system down. Erie zone valves are the same way, with their "Pop Top" zone valves. That means that if the problem turns out to be the zone valve, you can fix the problem by replacing the actuator on that zone valve yourself. Maybe take a look at the zone valve and post any markings you see on it. That will tell us what make and model of zone valve you have. Most zone valves operate much the same way, except Taco zone valves which I have virtually no experience with. All Honeywell and Erie zone valves will have a manually open lever like that, and that works much the same way. If the valve ever craps out in the middle of winter, the manual open lever allows you to open the valve manually to have continuous heat, which is better than no heat at all. You just push the lever forward (against spring pressure) and hold it down or up (depending on the valve) so that it catches in a slot as the spring pulls the lever back into it's original position. As long as spring tension holds the lever in the slot, the valve will remain in the open position to allow water flow through it. Check to see that your manual open lever isn't engaged, and thereby overriding the normal operation of the zone valve. 2. Take the cover off the zone valve (on a Honeywell or Erie, it just pulls straight off) and have a helper turn the upstairs thermostat all the way up and all the way down while you watch the operation of the upstairs zone valve. Watch the machinery under the zone valve motor, and see if that machinery moves all the way in one direction when you turn the thermostat up, and all the way back again when you turn the thermostat down. If the zone valve doesn't respond to the thermostat, check that the zone valve is getting the correct voltage (typically 24 VAC) when the thermostat is turned up and 0 VAC when the thermostat is turned down. There should be markings on the valve which will tell you what voltage it operates on, and normally that will be 24 volts AC, which isn't enough to give you a shock. However, the valve may be equiped with an "end switch". The job of the end switch is to close and thereby complete a circuit just as the valve finishes opening. Often this end switch is used to turn on a 120 VAC circulating pump for that zone. (So, the thermostat opens the zone valve, and as the zone valve finishes opening it's end switch turns on a zone pump.) So, be careful what you touch because if you have an end switch in your zone valve, there could be up to 120 volts AC being switched on and off by that end switch. If there are only two wires going into the zone valve cover, those two wires go to the motor, and you don't have an end switch. Feel the motor inside the valve, and see if it's hot. If it is, that's typical of a motor that's simply stuck, and all it needs is a shot of WD40 to get it working again. 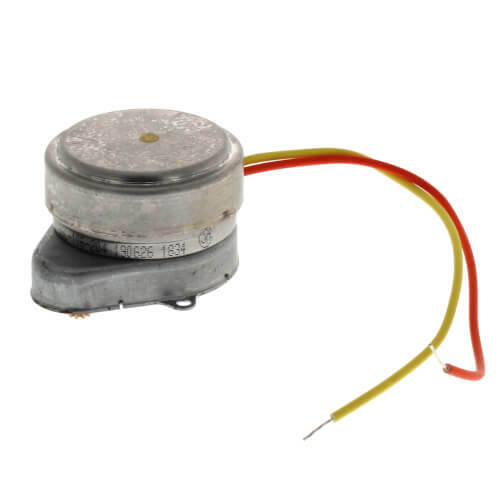 These motors are tiny, and it just takes a bit of friction to stop the motor from turning. If the motor won't turn, the zone valve is stuck in whatever position it was when the motor stopped turning. Besides any markings on that zone valve, could you confirm that your heating system only has a single circulating pump for all three zones. I'm presuming it's only the one pump because if you had separate zone pumps, the zone control wouldn't be turning on the zone pump for the upstairs zone if that thermostat wasn't calling for heat. And, without any hot water flow through the upstairs radiators, it wouldn't be any warmer up there. way it should other then an occasional frozen pipe on the second floor and a broken circulator. For some reason we have had this odd thing going on for the past week. The second floor is constantly hot, like 73 degrees. The first floor is steady as it should at 68 degrees. This is with temps outside around 30-35. I have the thermostats set up to turn the heat down to 58 at nigh t and for all the time we have lived here the second floor would be hitting that by the morning, just before it goes back up to 68. Now, I get up i n the middle of the night and it is still in the 70's. I even turned it off at the thermostat, the radiators are still hot. I took the thermosta t controller right off the wall, no diff. The funny thing is if I check the zone control on the boiler, the zone is not calling for heat, but the r adiators are always hot. There will be a zone control valve for each area. Obviously one is remaining permanently open. It's either stuck or there is an electrical fault apertaining to it. Either the motor that opens/closes the valve, the associated wiring, a relay in the control panel or the control system. e way it should other then an occasional frozen pipe on the second floor an d a broken circulator. Thank you all for the info. I took a look and could not find zone valves i n my system, just a type of one way valve at the beginning of each run. So I called the oil company and they sent somebody out that confirmed this. One was bad and he replaced it, so all works now. Umm...wouldn't a valve at the beginning of each run be a "zone valve"? That's what I was thinking, it's a matter of terminology and understanding each other's use of English. Please remit $48.50 for internet consultation. Thank you all for the info. I took a look and could not find zone valves in my system, just a type of one way valve at the beginning of each run. So I called the oil company and they sent somebody out that confirmed this. One was bad and he replaced it, so all works now. wired 2 zone heating problem.